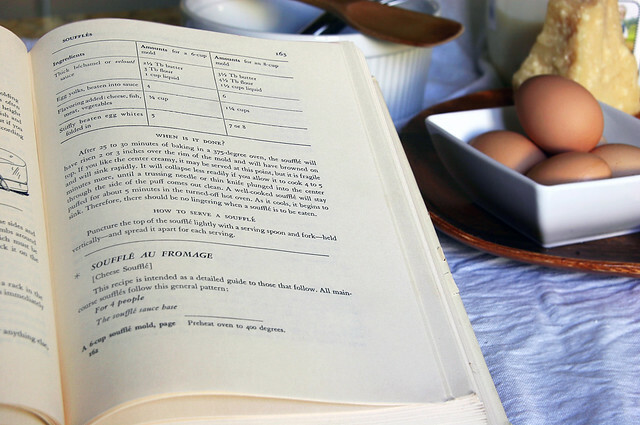 As I see it, fresh eggs deserve a light touch so that they can shine, thus I turned to my copy of Julia Child’s “Mastering the Art of French Cooking Volume I”, bequeathed to me along with Volume II by my mother, for her soufflé au fromage recipe. People are frightened of soufflés, it seems. I must admit, I’ve a touch of the fear myself, despite having made my fair share. I reason that they are quite prosaic & provincial, something French mother’s whip up for dinner, and therefore I needn’t fear them. But, like the much maligned macaronage, it is the step of folding in the whipped egg whites that causes people the most trouble and consternation. The key is just that: folding not stirring. Child says that the entire folding process should take no longer than a minute. While I read cookbooks voraciously, it’s actually rare that I open a cookbook to actually cook out of these days. I, more often than not, do not use recipes (or use my own), and when I do consult recipes it’s often a dizzying array of recipes collected from the vast archives of the internet. Opening the book was comforting, as is opening most old books. It’s the same visceral experience of listening to an album on vinyl: sensual, tactile, grounding… humanizing, even. The yellowing pages, like the perfect imperfections of a record’s crackles and pops, and Child’s clear, orderly instructions were just what I needed to calm any lingering nerves I may have had surrounding my ability to not deflate my egg whites, stomp around the kitchen whilst the soufflé baked (which I hear is dangerous for the very life of a soufflé…and I’m a girl who stomps), or my doubts about my non-convection oven’s ability to cook a “proper” soufflé. With Child’s guidance I assembled the minimalist mise en scene, prepared my béchamel as per her instructions, and calmly folded in my egg whites, though I think I may have under folded, which she notes is preferable to over folding. My soufflé rose to about two inches higher than pictured. Anyone who has attempted to photograph a soufflé can empathize, I’m sure, with the difficulty of capturing it before it deflates. That said, I do not think I’ve achieved perfection, but it was a delicious, airy dinner alongside a bright spring asparagus salad. I am a bit of a perfectionist, as it were, and I foresee many more soufflés in my future, as I continue to attempt to master them. Next time I’d like to use a local Sequatchie Cove cheese and some of my raw milk to really bring it home. Also, next time I will add a pinch of cream of tartar to my egg whites for more stability. This was along the lines of my platonic ideal of a dinner, as I like to think of my personal home-cooking style as existing in a modern place between grandma and grand-mère, equal parts southern soul food and Provençal. I served the simple parmesan soufflé with a salad of local greens, Alexzanna Farms asparagus lightly steamed, local radishes & spring onions shaved on a mandoline, and a simple creamy goat cheese dressing. It’s great cooking for a man that acknowledges this as “real food”, and doesn’t look sullenly about for a slab of meat. I’ve dated my fair share of southern men and can say with confidence that he’s a rare breed. Don’t get me wrong, I like to work with meat, slabs of it even, but we don’t generally eat a lot of it at home. He prefers soufflé & quiche to bacon, won’t eat bacon, as a matter of fact. I think it bespeaks of some darkness inside of him, but I love him regardless of his soulless aversion to bacon. I digress. 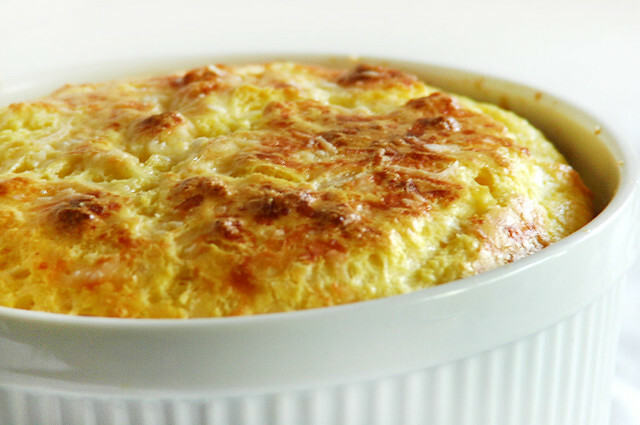 Incredibly quick and easy and luscious enough to please just about anyone, this soufflé is an affordable dish that uses some of the most basic pantry ingredients yet yields a very refined result. Also, it is infinitely adaptable and quite quick to literally whip up. So. 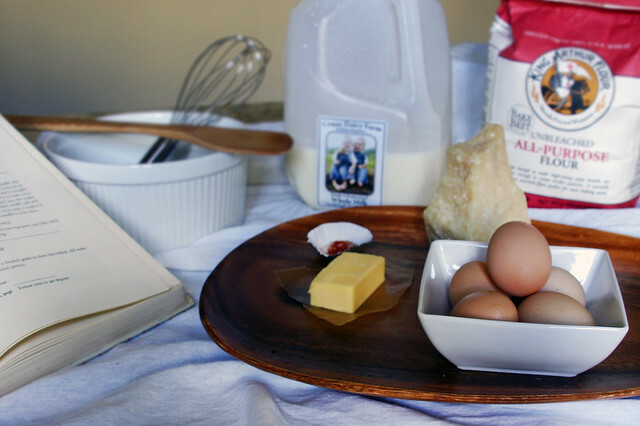 I exhort you, buy some fresh, local eggs, local milk, & good cheese (local too if you can! 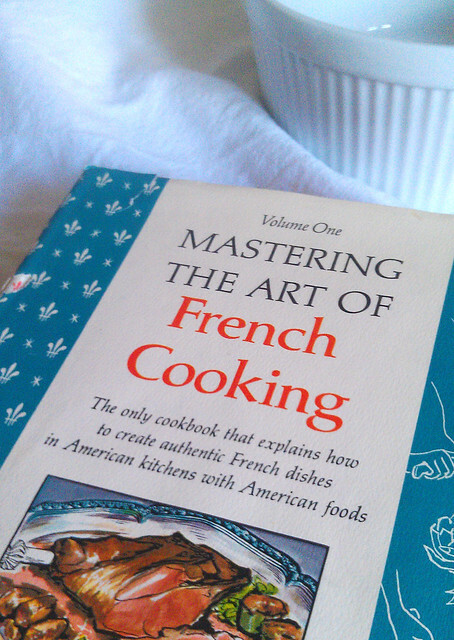 With the Sunday Market starting back up, there will be ample opportunity) and go forth and bake soufflé. It’s things like soufflé that make life feel special. You’ll feel super extra fancy, I promise. And you can still pretend it was crazy hard, you know, for the laurels. Due to copyright, I will not post the recipe verbatim as it appears in the book, which I strongly urge anyone with even a passing affinity for cooking to buy (look for a vintage copy online!). It is canonical, something to pass down to your children like a dog eared Bible. But here is a link to the recipe as it appears on Epicurious as “Classic Cheese Soufflé” adapted by Molly Wizenberg of Orangette fame. 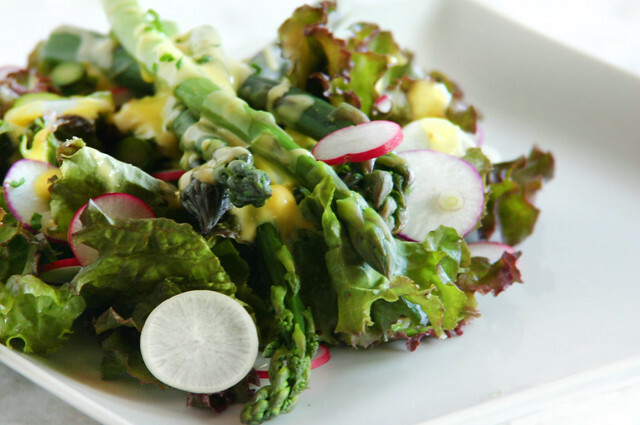 The simple recipe for the salad follows. I encourage you to adapt it to use what you have on hand, what is fresh. The dressing sounds simple but has recently become my absolute favorite. 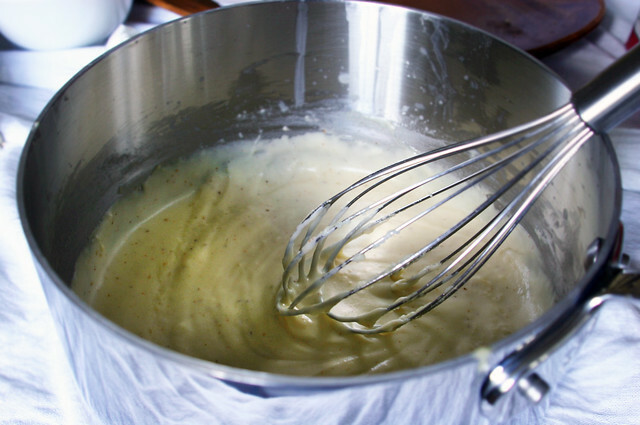 It’s almost like a faux hollandaise but lighter and far easier (though hollandaise is quite easy too!). 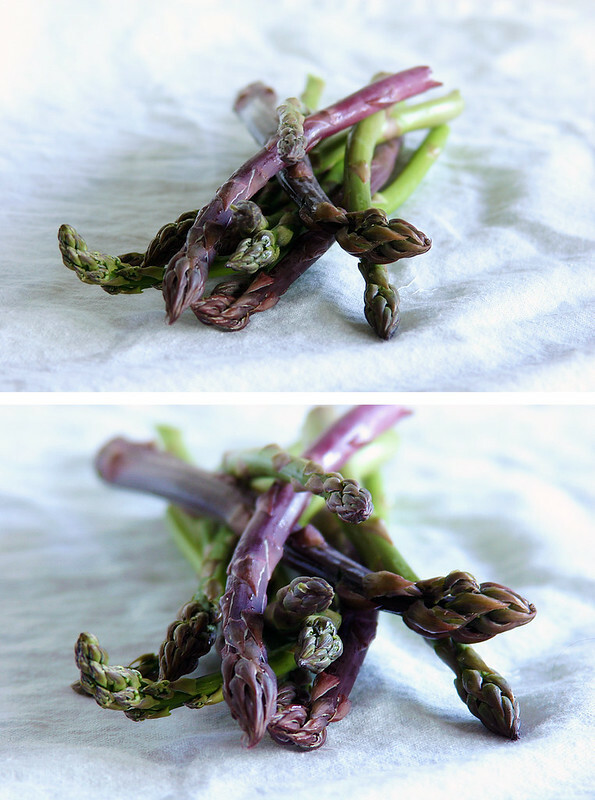 Excellent for dressing spring asparagus without over-powering them. 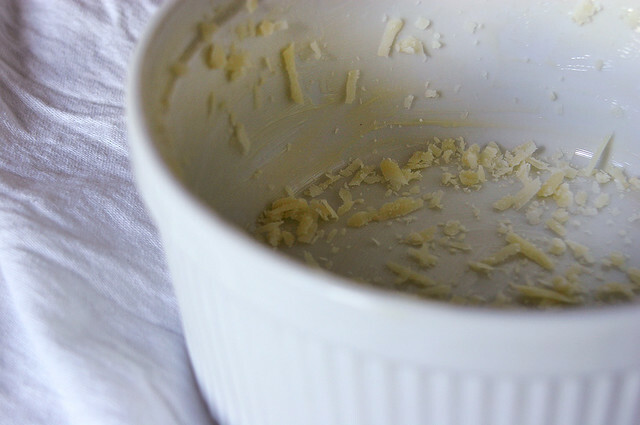 Mix egg yolk and goat cheese with a fork in a small bowl until creamy but pieces of cheese remain visible. Add a splash of raw milk and stir to reach desired consistency. Mix in chives and salt & pepper to taste. I had been looking for this book for a while when I saw a 1968 copy of it on the shelf at my favorite used book store. It even had an inscription from one old lady to another (or at least I like to imagine that they were old ladies!) and I immediately knew that we were meant to be together. This souffle is one of my favorites. Volume 2 is wonderful as well if you don’t own it….it has a bread chapter. My pain de mie is a whole wheat adaptation of Julia’s. My mother gave me vintage copies of both I & II, though I get nervous cooking with them because the paper sleeves are about to disintegrate but they’re too lovely to take off. I’m careful with them, but careful isn’t my m.o. !